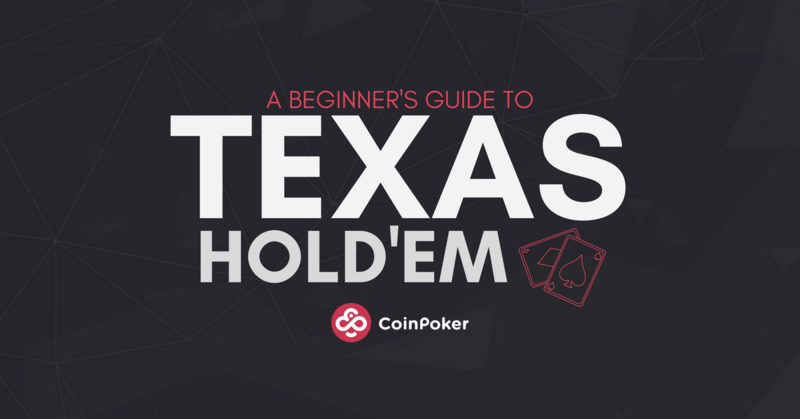 New to Texas Hold’Em? Find out how to play one the most popular card games in the world by reading this beginner’s guide to our favourite poker game. In this super popular poker game there are four “rounds” of bets during which players can bet, bluff, or back out depending on the strength of their hands. As each level passes, more community cards are dealt to give them a better idea of how strong their hand is and the probability of their opponents having better hands. Hole cards are the first 2 cards each player at the table is dealt, and are always face down. Only you are able to see your hole cards, and during this first round the small and bing blinds are played. Afterwards players can choose to match the big blind to play the round, or raise if they have a strong hand (or want others to think they do). Community cards are the public cards set face up at the table. 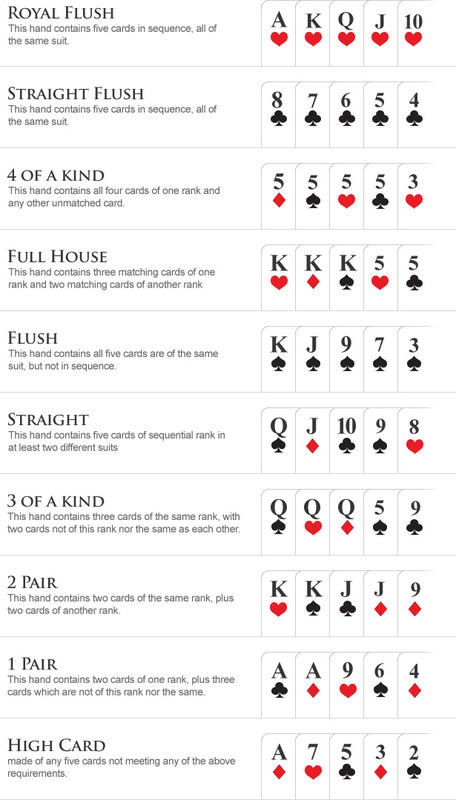 In total five are dealt, and players can choose any three to combine with their two hole cards to make the best possible hand. The flop is the first set of three cards, and during this phase players have a better idea about the strength of their potential hands. Here you can check or bet depending on your strategy. The turn card is the fourth community card to be dealt, and after it hits the table players can once again choose to bet or check to see the next hand. The final community card is the river card, and after this the final round of bets take place. Players can choose to bet or check once again, and here is the last opportunity to bluff out other players before showdown. Showdown: Betting or checking until all community cards are dealt, then comparing hands to determine the winner. This is done based on Texas Hold’Em hand rankings which are listed below. Out-Betting Your Opponents: If you place a bet or raise to an amount that makes all other players fold, you automatically win the hand no matter what cards you have. Generally speaking there are two types of poker games: tournaments and cash games. Cash games allow you to sit in at a table and leave whenever you want. You come in with a set amount of “cash” or in CoinPoker you can take 20 to 50CHP, and use that to play until you lose and rebuy, or win and leave whenever you’re ready. Cash games are fun and commitment free, and for players who enjoy the freedom of being able to play and win at your own pace it’s ideal. The blinds do not increase, and depending on your budget and bankroll you choose the level you’re comfortable with. Unlike tournaments, you can join or leave anytime you want and cash out your chips once you do. Tournaments are awesome ways to win massive pots for a fraction of the cost, which comes in the form of a buy-in. Tournament buy-ins on CoinPoker range from Moon tournaments with 25CHP to Deep Space tournaments with 5,000CHP! Re-Buy: Players can buy themselves back into the tournament until the Re-Buy period ends. In some cases there are a limited number of Re-Buys per player, alternatively there can also be unlimited Re-Buys depending on the structure. Freezeout: No Re-Buys available, once you’re out, you’re out. Unlike MTTS, Sit and Gos have a set number of players required for it to start. Once that number is reached, the game begins and no other players are allowed to register. Spin & Go tournaments start as soon as three players join the table. Once the three pay the buy-ins a wheel is spun to determine the prize pool. The minimum prize pool is 2x the buy-in, but the addition of this “wheel of fortune” feature is that it can also be thousands of times higher than the buy-in depending on your luck. Any one of the tournaments about aside from Spin & Go can be a K.O. tournament. What this means is that players get awarded a certain amount for busting out another player. This reward is called a bounty, and what’s interesting about this type of game is that you don’t even need to make it to the final table to win big. Half of the prize pool is allocated towards rewarding knock outs, which makes playing interesting as not all of the players have their eyes set on the top positions. As many times as you read this, the best way to learn how to play is to practice. Join one of our multiple daily Flyby Freebuys to test your skill for free, and potentially win some CHP in the process. Click here to play some poker! Only playing with ethereum ou can be BTC? Players can play using CHP tokens, which can be purchased on one of our listed exchanges using BTC and ETH. Previous Post [FAQ] How Do I Send CHP Tokens to My CoinPoker Account?